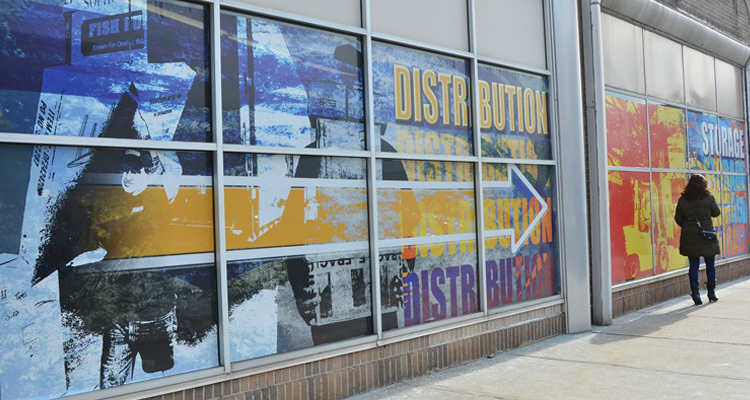 A fast-and-easy solution for temporary window graphics is a one-step product like LexJet Print-N-Stick, which is also available in a Solvent version. Both offer a nice, smooth white finish that has some water-resistance that stays fresh-looking for up to a year. As the name suggests, it’s a quick and easy print-then-stick application process, and the product is easy to cut into shapes and corners. Check out this video to see it in action. 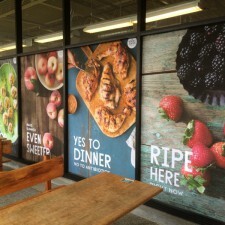 Print-N-Stick works for a number of applications, from retail signage to classroom settings and beyond. It’s ease of use makes it a quick install for nearly anyone. 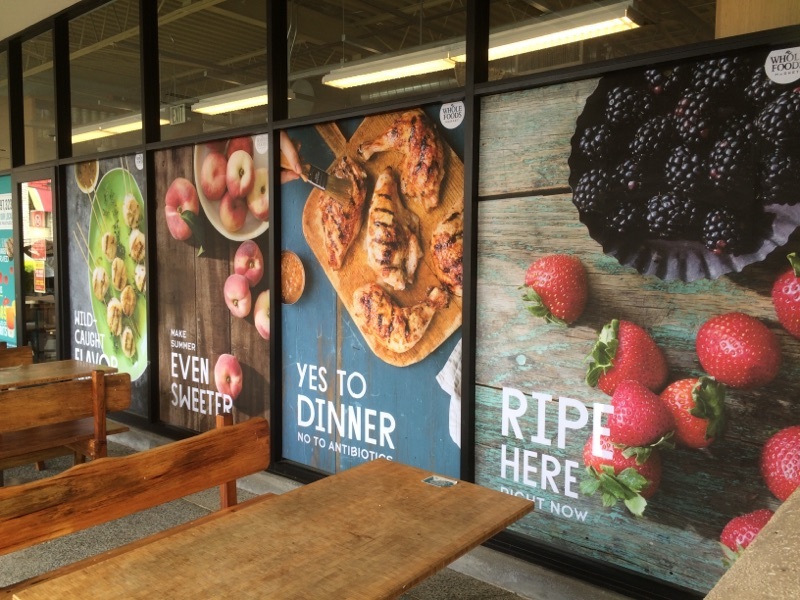 Our newest pressure-sensitive option is the market-changing HP Adhesive Vinyl line. 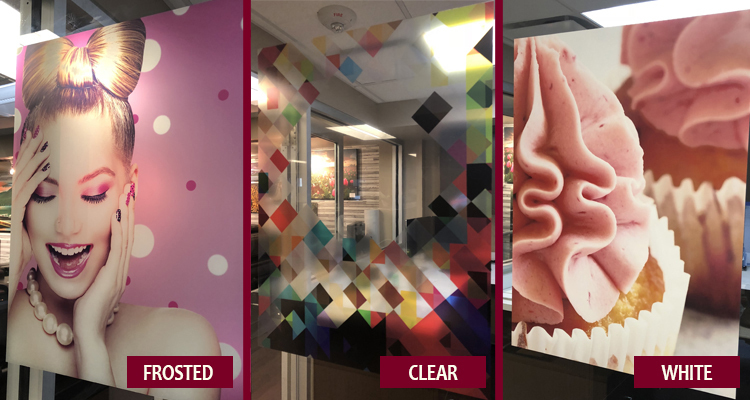 For example, HP Prime Gloss Air GP provides sharp, vibrant colors and its air release liner and gray permanent adhesive allows for bubble-free installation with excellent opacity, when you want more privacy or to block out glare. Other unique options from the new HP line include the printable HP Matte Polymeric Overlaminate, resulting in a frosted window appearance and HP Gloss Polymeric Overlaminate, which offers a clear image finish. 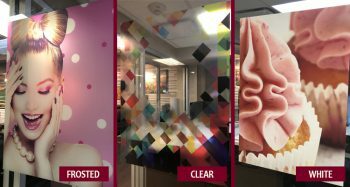 While many office settings are constructed with large windows for natural light and openness, some companies have found the clear “walls” can do double duty by highlighting brand messaging. Conversely, when the windows are too much transparency, companies are looking to products like the LexJet Simple Grip line of products. These cling-like products are easily installed with a wet technique using a product like Marabu Window Juice. Original LexJet Simple Grip has a slightly frosted texture, which illuminates nicely with either natural or artificial light. It is a bit translucent, so it offers a bit of privacy in an office setting. LexJet Simple Grip Clear is completely transparent and will only offer some coverage where it is printed. It works well when adding subtle accent graphics to a window. LexJet Simple Grip White provides the same easy installation and removal as the other versions, but with a white finish that not only provides additional privacy, but allows extra-vivid colors to really pop.